Electric Man 4. The subject of much discussion. 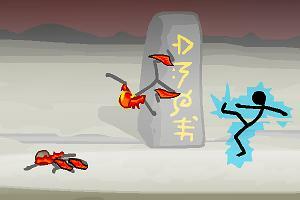 The tournament of Voltagen is where we last fought to the death in the popular flash game Electric Man. Although there is little news on the matter, we are still anticipating the arrival of Electric Man 4 which should be a great new game in the popular series. Hopefully we will see some great new graphics and improved visual effects as well as new moves and character designs. Right now the game, although very fun, is not very amusing to say the least as it gets too boring and repetitive after several rounds. There is no real plotline or character developments, just fighting to the death against several vicious opponents. While this is the basic principle of any fighting flash game, Electric Man has a lot more potential and there are lots of features that can be added to make the new game much more exciting and interesting. To start things, it would be great if the game developers would think more about the storyline which is totally missing from the original game series. If the play must fight in rounds against different opponents, why not add some story to that as well? Why not make things more interesting and tell us more about this lone warrior who is fighting to his death. What drives him? What are his goals, fears, hopes and motives? It would be great to get a background story and watch it develop as you progress through the levels. And speaking of progress and levels, it would be nice if Electric Man 4 could include more options to grown and customize your character. Right now you can just edit some basic details at the start of your adventure and that’s it. It would be ideal if the game could take a more RPG oriented turn and allow the player to gain experience and level up their talents, skills and learn new moves. The enemies should also advance along with the player. There should be more of them, thus making more rounds and more dangerous opponents and difficult boss fights. In the previous installment of Electric Man we had an opportunity to see what it was like to fight against the Frozen, the Pyromaniacs and other factions. Why not improve these concepts and add more of them? It is certainly something that is possible, but does the developer have enough motivation and will to do this? Aside from adding more features to the currently mediocre gameplay, it would also be great to see some advanced graphics, visual effects, and cinematic cut scenes as well as improved audio soundtracks and voice acting (if possible). But the more we try to improve the game like this, the more it loses its focus from the most important aspect of Electric Man – the ferocious fighting! This is the part where the developer will give his all to get to a whole new level as the fighting makes the whole game a successful flash adventure game. All in all, there some rather high expectation lingering in the air and hopeful Electric Man 4 will find a pleasant way to surprise us all.